Brand New Challenge Blog for Latenightstampers! Gift Card holders--a HUGE need this time of year! 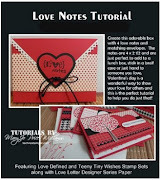 Try Stampin On Tuesday meets LNS! Top Three for sketch 246! Top Three for Sketch 245! 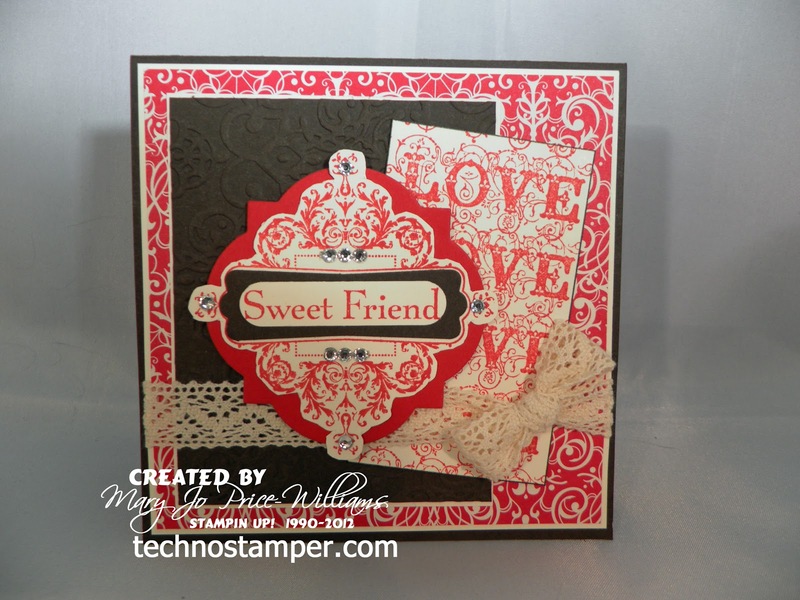 We are so excited to share the grand opening of our brand new challenge blog for Latenightstampers everywhere! Our group has been doing challenges for a long time now and we have often struggled with how to keep everything in one place--well, no more! We now have our very own blog. We would love for you to hop on over and check it out. We are still fixing a few quirks but it is ready for you to play along! Come on over and play along. Don't forget to follow us using your favorite method then you will get the challenges delivered right to you! Our first challenge also has a prize attached so be sure to head over and check it out. Now that Christmas is over it is time to send out those Thank you cards. I decided to take some left over cards pieces and turn them into thank you cards for my son to use. Of course I chose to use snowflakes so tht it would fit our first challenge. 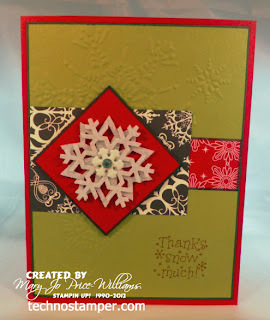 I used some old felt snowflakes that have been retired for a bit now but I still have some. Hope you find time to play along and check out the rest of the teams projects too. 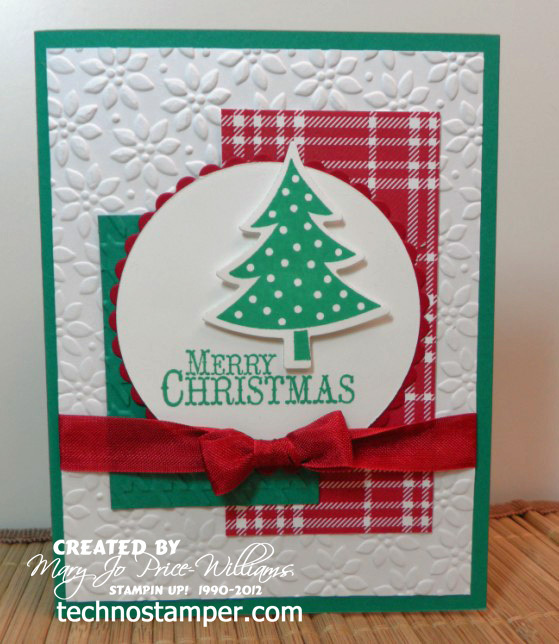 Merry Christmas from our home and the Try Stampin' on Tuesday Team too! I hope that all of your Christmas wishes came true today. May you day be filled with much joy, laughter, love and family! We have a house full of SICK people. My 12 year old has slept for over 36 hours now and is really feeling bad and of course since I spent so much time by his side I too am sick! I think I have slept at least 19 hours now too. Crazy! Now I must say I am not normally a fan of square cards and if you check out the other designer team samples you will see some great ways of changing this sketch to the regular size. I chose to stay with it and go in a direction I am not comfortable with all the way around. Kind of a vintage style--not my ususal but I think it turned out pretty good--it is good to strethch yourself sometimes. Well, I guess I am going back to sleep for a bit! My head and chest hurt. Come on over and play along with us--or at the very least take a look at all the beautiful cards the rest of the team designed. Welcome to another week of Try Stampin' on Tuesday. What a great sketch we have for you to play along with this week! I decided to move on from Chrismtas and make a New Year's card. Isn't this a fun card. I used lots of tiny little pearls to make the fizz! Love how easy and cute it was. 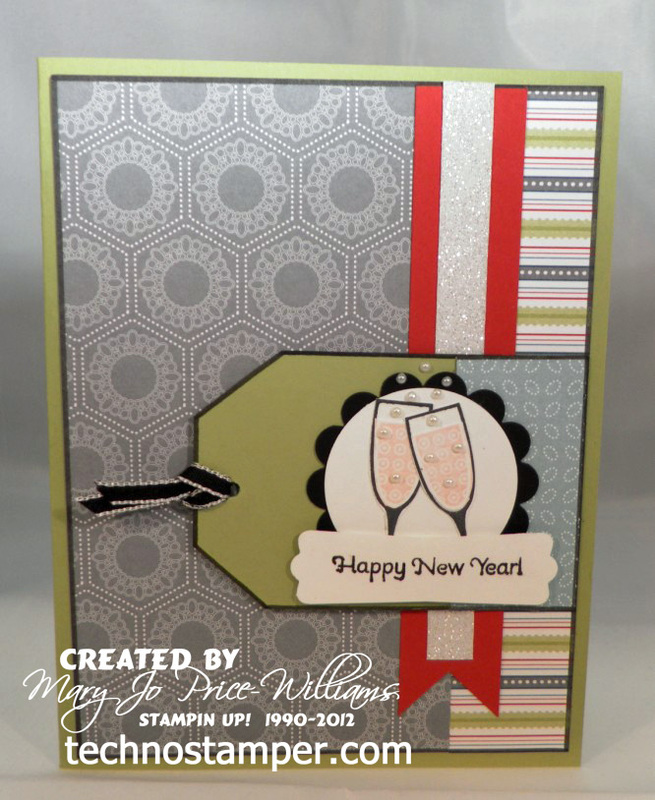 Other: markers, sparkle paper, pearls, circle punch, ribbon, scallop circle punch, modern label punch. I thought I would share of few of my favorite sketches from this year -- these are from the last six months. I did not think I could choose from ALL the sketches--so thought I would just go back six months for now. If you would like more details on any of these you can find them by clicking on the sketch or sample. Which is your favorite??? I think I was just looking for samples that were NOT Christmas, lol. A desk top computer that dosen't have an attitude! Not sure what the deal is but every few months my desktop--which has all the programs and attachments for my posting--goes crazy on me. I really don't want to spend money right now on a new desk top computer since I have my laptop and we have quite a few other computers in our home. BUT--all of my posting and editing tools are on there. I was able to get it to cooperate long enough to get three cards edited! 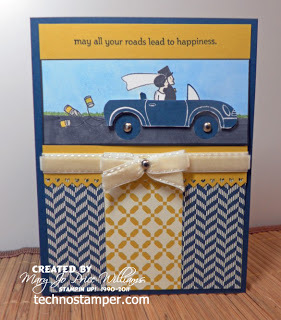 Good thing too cuz the Try Stampin On Tuesday sketch was due today! Just in time. 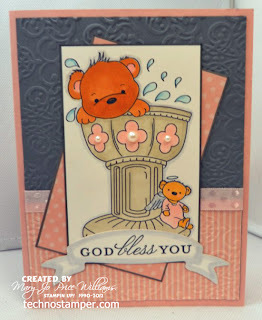 So since I was able to get a few cards edited I am posting from my laptop. 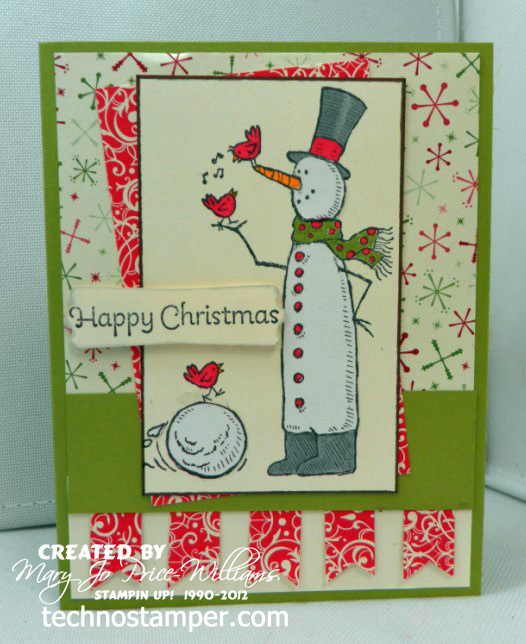 I still have quite a few Christmas cards to share..althought I am so "done" with them you may still need ideas. 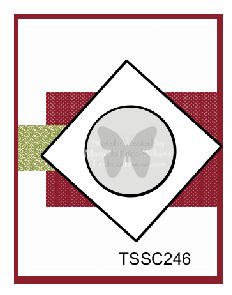 Today's card is actually using a retired stamp set that I always loved. Do you recognize it?? Nice and Easy but certainly gets to the real meaning of Chrismtas! Hope to be back tomorrow--if these silly computers cooporate. Buenos días! Or good morning! My son has decided that he wants to learn Spanish--I thought that might be a fun thing to do on-line together. We learned Good morning, hello, and I want to go to the bathroom last night! Weird place to start but what the heck. I am nearing the end of my Christmas card making and I am going to be so glad to move on. But for now I am still sharing Christmas cards with you. I decided not to use different papers or patterns on the sides--instead I used an embossing folder on each side. Kind of like how it turned out. 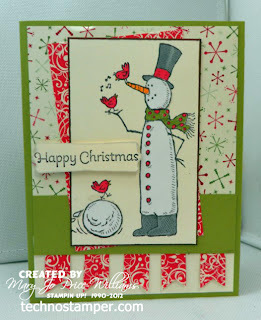 Love this snowman image--actually I love any snowmen images, lol! Kind of like butterflies in my book, you can't go wrong. I hope you find time to play along with us. FYI my Monday sketch challenge will begin again in the new year for those of you asking. Didn't you love making snow angels when you were a child! What am I talking about I still love to make them--those and the flowers that you can make with you foot--did you ever do those? I seen this somewhere where someone make a snow angel with this darling little gingerbread and knew I had to take it and run with it. 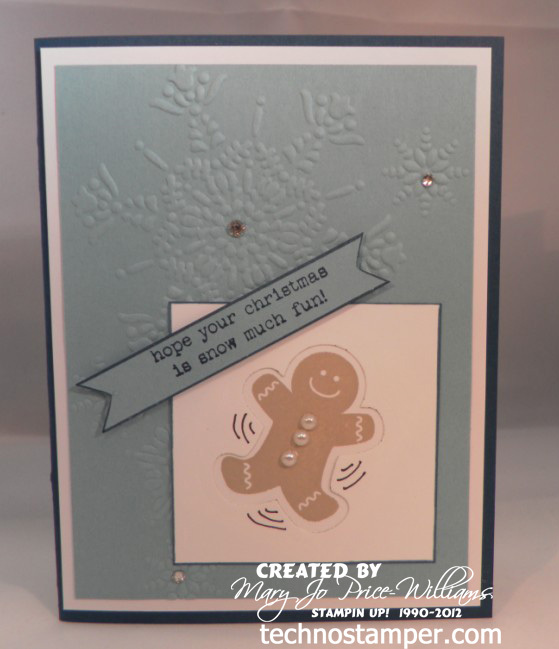 This was actually one of the cards we made at my final Christmas card class this year. Now that all my Christmas cards are done--I need to find all my addresses--I changed computers and I think they are still on the old broken one--it is ALWAYS something ya know. Well anyway, back to the card for today. 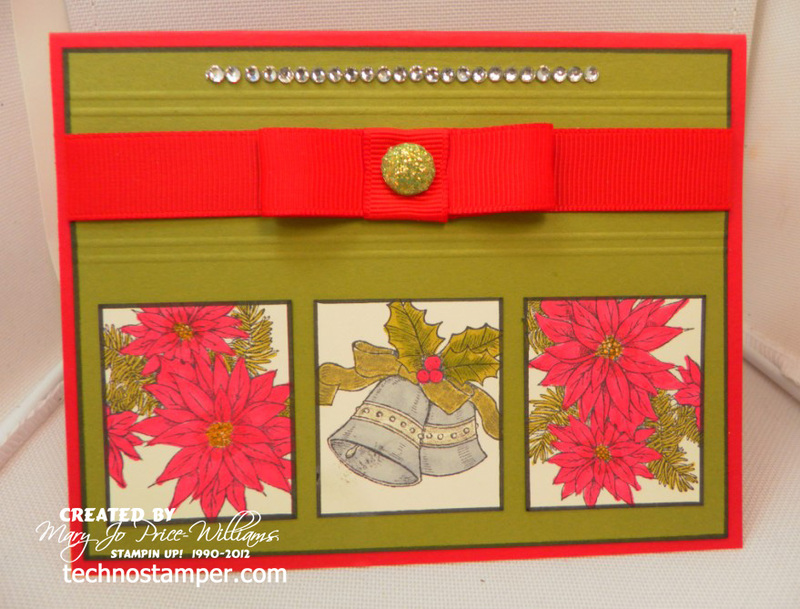 I used the Scentsational stamp set and die set--one of my favorites from this year's Holiday catalog. TGIF! Hope you are on your way toward a great weekend! I don't know about you but there are many teens on my Christmas list and I never know what to give them. So what generally happens is that I get them some small token gift and then give them a gift card. But what fun is that???? Well, it is lots of fun if you give it in a double slider gift card holder! Don't you think this is fun??? Of course I didn't have a gift card on hand so I used my Kohls pints card. But you get the idea. What to know how to make it?? It is really easy. 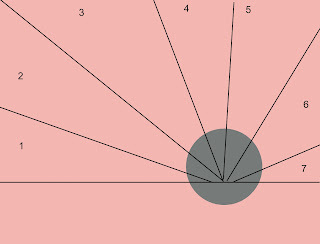 score at 1/2, 3 and 1/2, and 6 1/2. Use a punch to notch out sections as shown in the photo above. The half circle will be the part that will hold the pull ribbon. 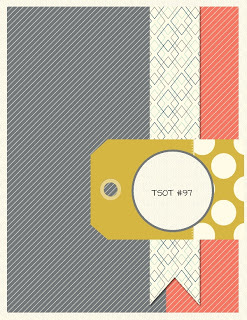 And the other two rectangle notches will be used as a track for the slider to follow. 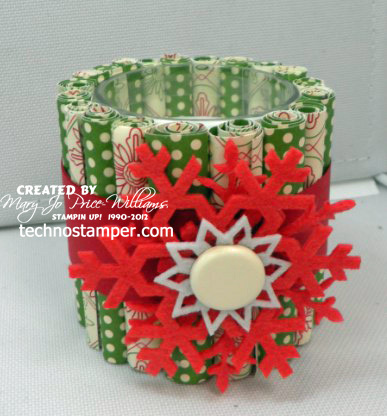 The part with the half circle will also be your front so you can decorate as desired. 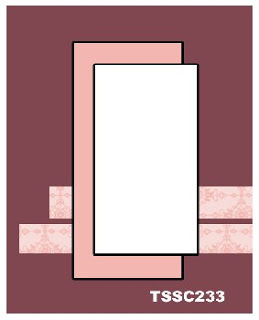 Next you will cut two pieces of card stock 2 1/2 by 4. 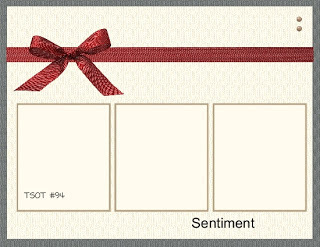 One of these will be the top slider and will have your sentiment stamped on it--the other will hold your gift card. You may go ahead and decorate these as you would like--you will need to keep them pretty simple though as any bulk will interfere with the slider. 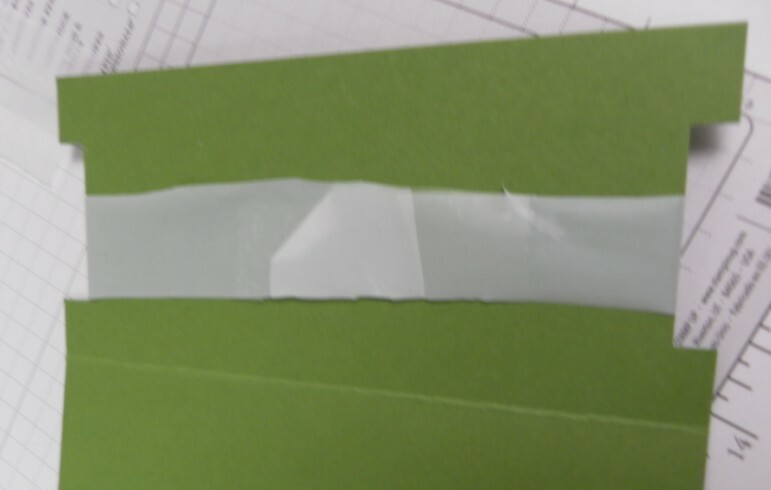 I used my snail type adhesive and just ran a strip down the back of the gift card and attached. And as far as the sentiment piece I kept mine very simple. I stamped the sentiment and actually re-attached the notch I cut from the front so that when it is closed it looks like it is whole (kinda, lol) You will need to punch a hole in this piece and add some ribbon. I used small pieces of scotch tape to cover where the ends meet and keep the flow smooth. Now comes the fun/tricky part. It is not hard, you just have to pay attention to how you add the pieces to you slider so that they will function correctly. 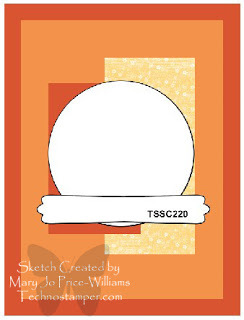 Lay you card stock so that the half circle opening is on the top left. Add a piece of double stick tape or adhesive to the plastic about 1 inch from the bottom notch. 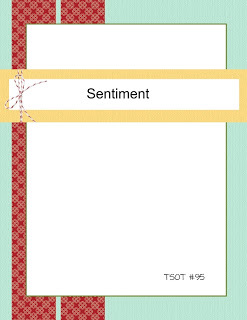 Now attach your sentiment panel to the tape with the top edge even with the top edge of the card stock base. Remember you only want a small section at the bottom of the panel to be attached and it can only be attached to the plastic bag. If any adhesive is on either the panel or the card stock base it will keep your slider from moving. 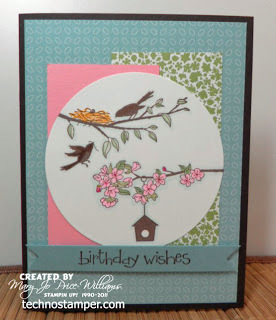 Next, with you sentiment layer in place and even with the top edge of the card stock base turn your base card stock over so that the the half circle notch is now on the top right hand side. You will now attach you gift card slider panel to the plastic bag the same way as you did the sentiment panel, except this time the gift card will be facing down (it will be the part attached to the plastic) and you will be lining it up to be even with the bottom edge of the card stock base. 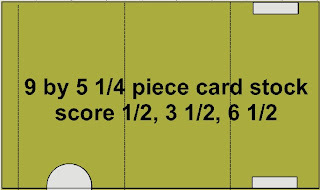 When you have this done you can just fold on your score lines and run adhesive on the small half inch section to hold it all together. I hope this makes sense--let me know if you need more pictures. Have fun making your gift card holders. 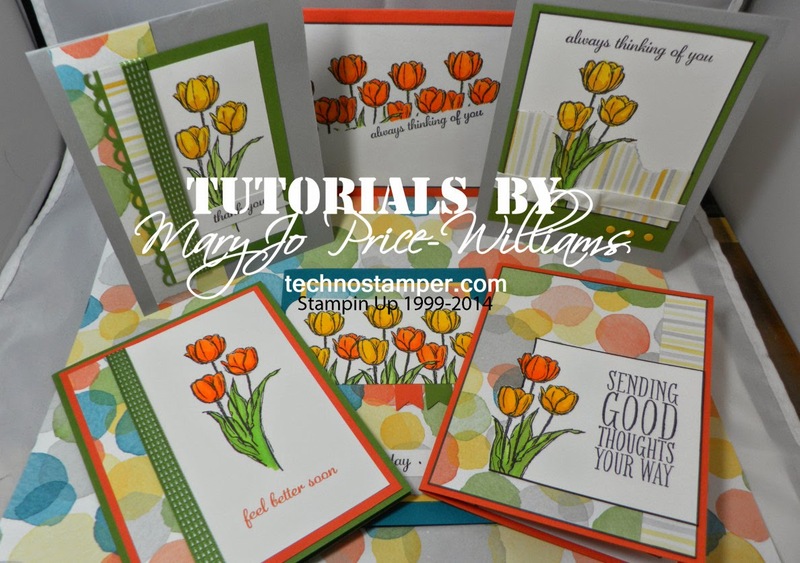 By the way--gift card holders are the challenge on Latenightstamper's this week so if you are a member over there you may want to check out all the different sample. If you are not a member--why not???? Guess what!??!! 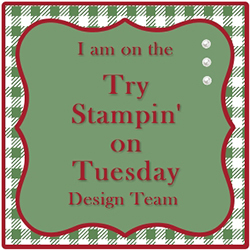 I am now a member of the Try Stampin' On Tuesday Design Team! How exciting is that! There are some extremely talented girls on the team so I know you will want to become aquanted with them right away! 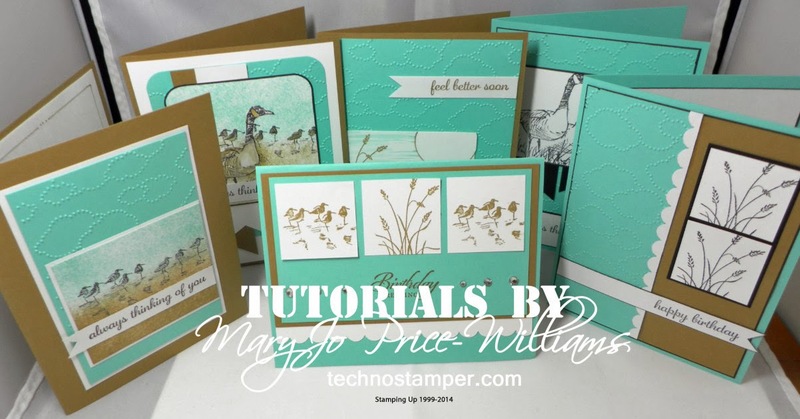 Check out the introduction post HERE you can see the other team members on the sidebar of the Try Stampin' On Tuesday blog. Here is my first official sketch... I really love it and will most likely do another card with it later today! 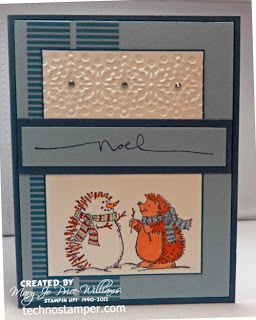 I really wanted to use this darling hedgehog stamp so I needed to move the strip down a little to accomodate. 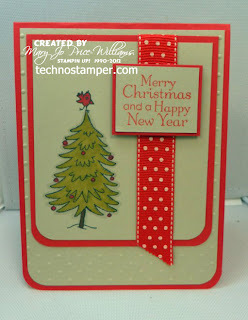 This set is long ago retired but I used at least one stamp from it every Christmas--so cute. We would love to have you play along with us! a fun card to share with you. I am posting late because I was trying to decide what to do about my sketch challenges. The participation has been really low lately and it is really discouraging--it takes me quite a bit of time to come up with all the sketches and I am thinking it is not really worth it. So with that being said I think I will let the challenges go --at least for the rest of the year. At one point I had a team of people who played along so it really didn't matter who else played along since we all played and visited each other and had fun sharing together. If I am able to put together another team to play along I will begin again in January! And if not--then I will just continue to share and do other peoples challenges--there are so many to play along with that I won't even miss my own, lol. So we will see where it goes from here--sometimes change is good. 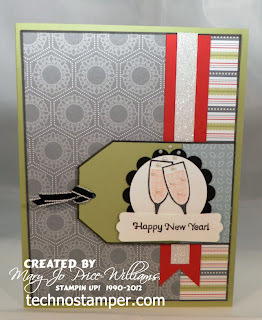 Starting tomorrow I will be one of the new design team members for the Try Stamping on Tuesday Blog! I am really excited to be a part of this great team! So be sure to stop back tomorrow to meet the other players and join in on the fun. And of course I am still on the Latenightstamper's challenge team. Here is a non-Christmas card share for you today--need to take a break from all those holiday cards every now and then to keep my sanity. 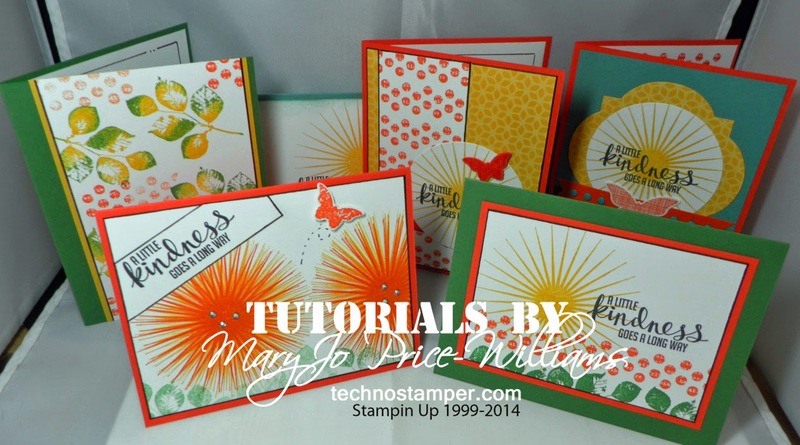 I have been wanting to do one of these star/sun burst cards for a long time but just never gave it a try--but there were lots of scraps laying around on my work table so I thought--now is the time! So I used those Christmas paper scraps to make a thank you card! Isn't that fun! Don't even look like Christmas Papers does it. Of course that paper pack is not a what you would call a traditional Christmas. The pack is called the Festival of Prints and it is available in the Holiday mini. 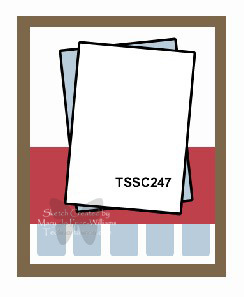 When I made mine I kind of eyeballed it but I did make a quick (and I mean quick) template in MDS to share with my customers. 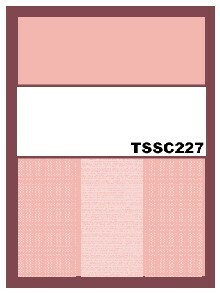 You can print it out and cut out all the individual starburst pieces. The file should be 5.25 by 4. Next choose your papers--I would use at least three different papers. Next you would just use some teporary adhesive to hold each individual starburst piece over you paper of choice and use it to cut your parts. 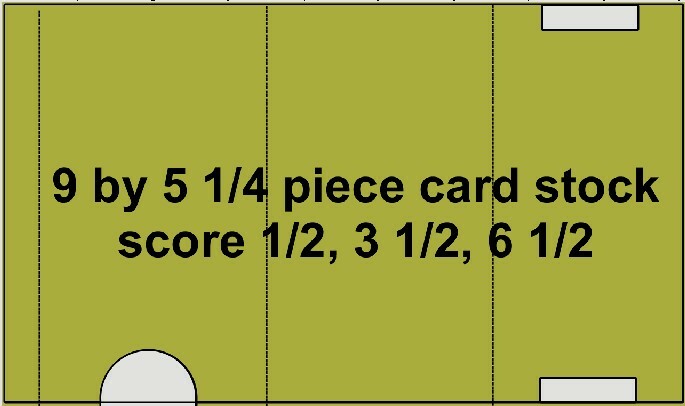 After all your individul pieces are cut you can just re-arrange on your base sheet in order. Don't worry too much about the parts that are behind the circle--it will be covered. Hope this makes sense -- if not feel free to ask any questions. 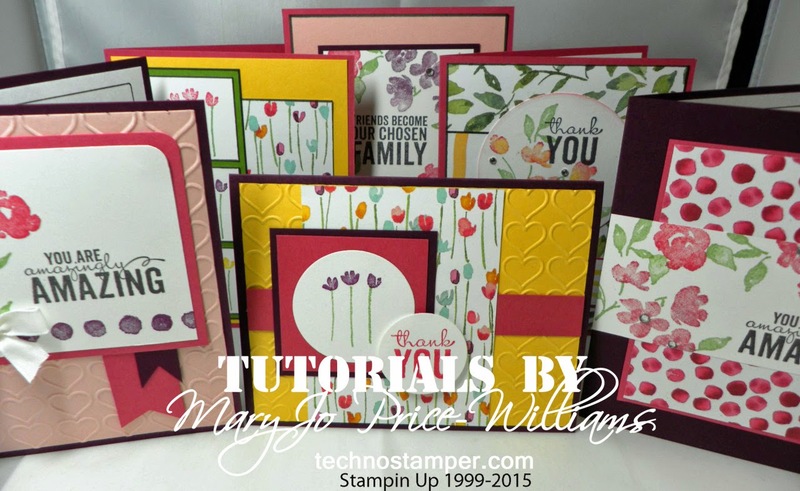 See you in the morning with the Try Stamping on Tuesday Challenge!!! This is a old picture but it is such a cute one. 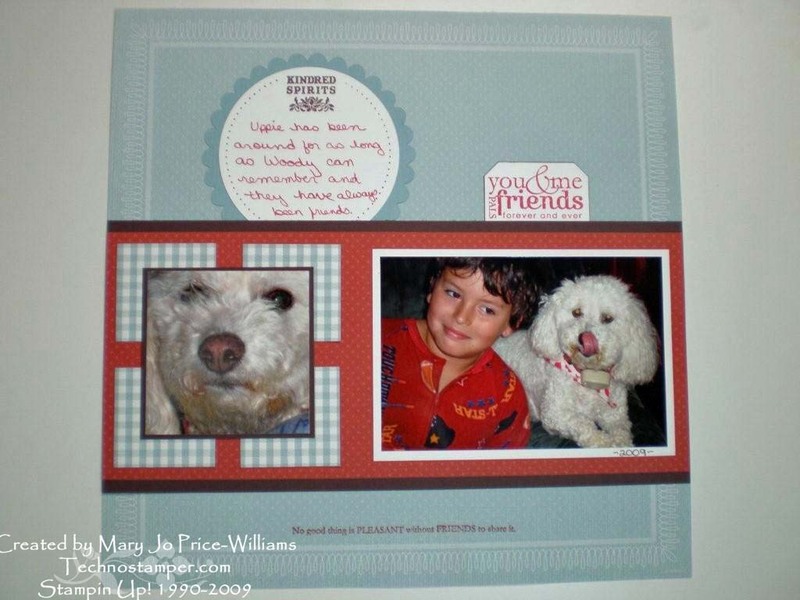 We will miss you Uppie-you were a great pet! Although we still have a small zoo in our home with other pets the we are sure feeling a void. Hope you day has been better than mine. 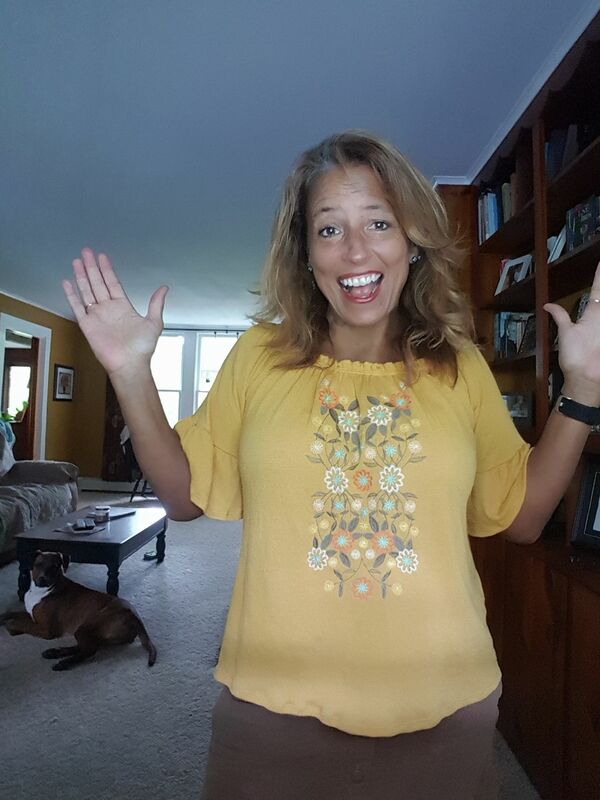 And the LNS challenge this week is to Sparkle and Shine! And sparkle to your cards how ever you want. I used rhinestones, glitter and a glitter pen. Other: markers, rhinestones, large green brad with glue dot and glitter on top--wide grosgrain ribbon, gold sparkle pen (non-SU) on the ribbon. 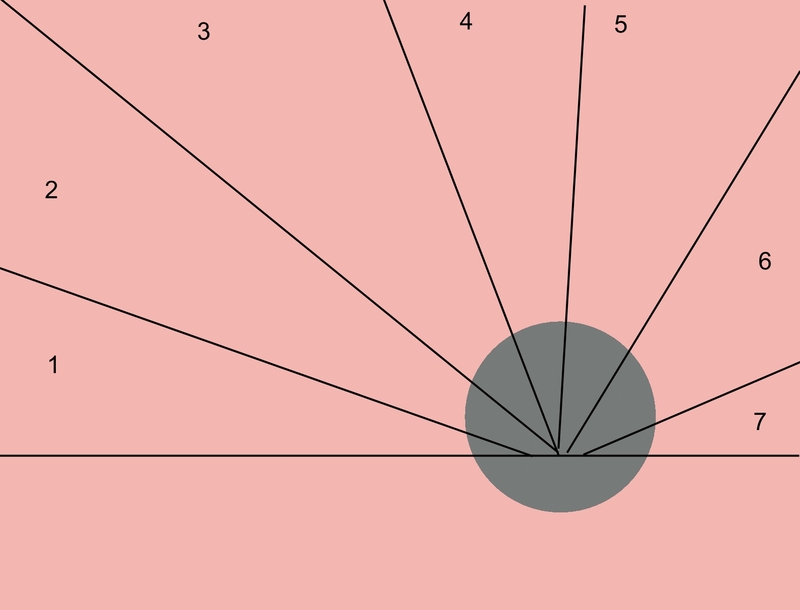 New sketch is posted each week on Monday morning--you have a full week to play along and add your DIRECT link to the linky tool at the end of the post. You can turn or flip the sketch in any direction that works for you. You can use whatever products you wish although I will generally use SU only. Top three are picked each week and the winners are invited to add my winning badge to their blogs--there must be at least 5 samples for the week for me to choose a top three. 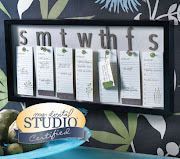 You can play along as many times as you want during the week--get your friends to play too--you can add the code for the linky blog hop on your blog and your readers can play along with you right from your blog! No need to send them elsewhere--you must add the link to your post while in the HTML mode. I have been pretty obsessed with snowmen this year, particularly this set Snow Much Fun. 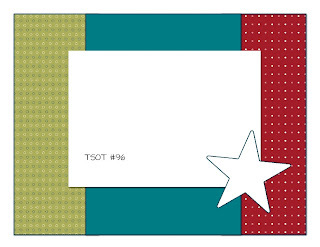 Tip: An easy way to cut little flags like on the bottom of this card is to cut a small slit up the center of the paper to the height you want then cut from the corners to the top of the snip--so easy! 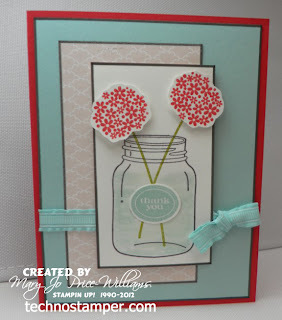 Now it is your turn to play along...be sure to come back and add your DIRECT link to the blog hop below. If you add the code to your post while in the HTML mode your readers can play along right from your blog! I thought this was a fun sketch... heard from a few you thought it was hard!? But I am guessing that is a good thing since it gets you to s-t-r-e-t-c-h yourselves. I love the samples this week. Check out the top three below in no particular order--please take a moment to visit their blogs and let them know that you too think they are awesome! Winners feel free to add my badge to your blog if you so desire. Be right back with the new sketch for the week! 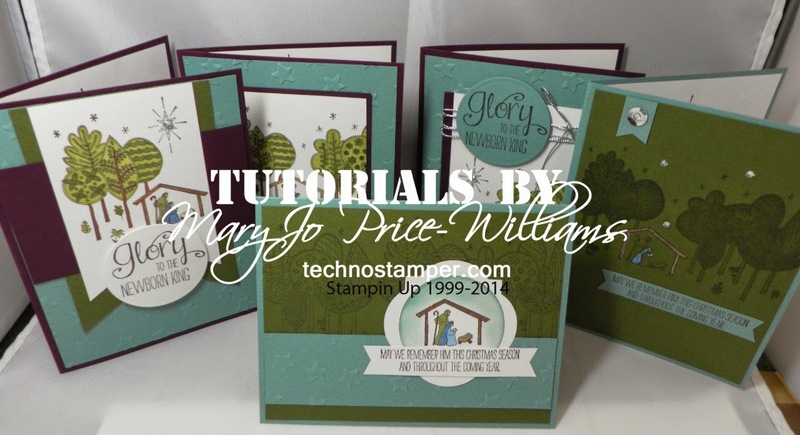 I do not have any Stampin Up! stamps for this occasion so I went on a web-search and found this darling digital image at Di's Digital Downloads. It is such a cute image. The sentiment is from Crosses of Hope that is a Stamin Up! set. Going to keep it short and sweet. I will be back later tonight with my new sketch for the week. If you have not played along please consider doing so--I think I need one more player to have a top three pick. Here are the details of the sketch challenge from this week. I hope all of my American friends had a fabulous Thanksgiving. We had a great day spent with family and a wonderful meal! So much to be thankful for! 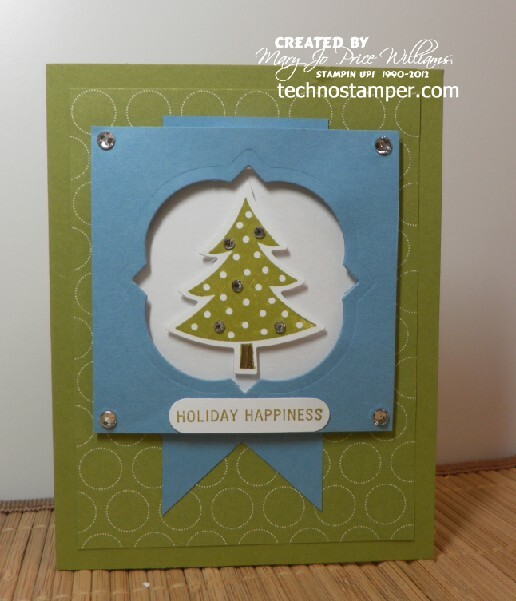 Today I am sharing a nice and simple, easy to mail Christmas card! I like these two colors together although they are a bit tough to photograph properly. 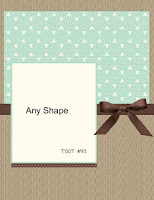 Other: markers, wide polka dot ribbon and the dots embossing folder, corner rounder. 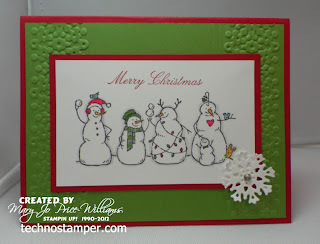 Over on Latenightstamper's this week we are focusing on our favorite color combos for Christmas. 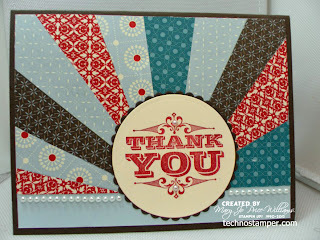 the last two days I posed cards with Cherry Cobbler and Lucky Limeade. Such fun colors. But for some reason I am always drawn to blue and white or blue and vanilla cards for the season. So here is my Midnight Muse and Very Vanilla sample for you. I just adore this Scentsational Season stamp set. 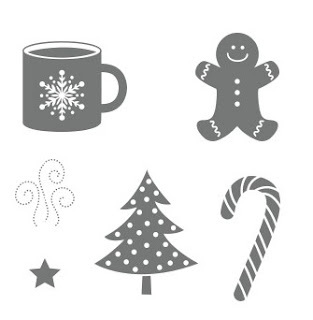 All of the images are so cute. 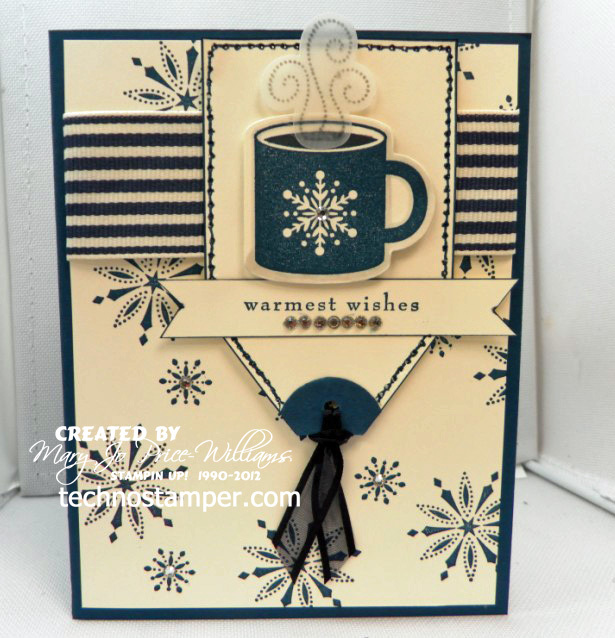 Tip: Stamp the steam on velum so that it is see through and looks more realistic! Happy Hump Day! And Thanksgiving Eve! I had some fun with the ribbon. Used little pieces of it to make the bottom edge of the focal image and then tied two different pieces together for the bow. Not so sure I love it--but I do like it, lol. 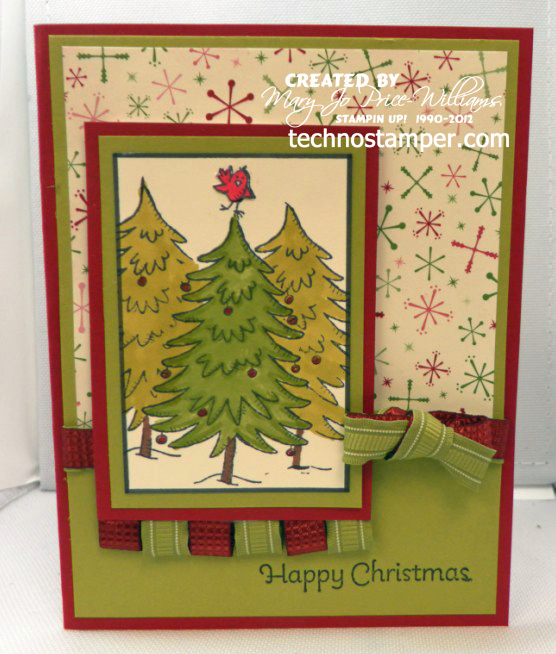 I used the tree from the Snow Much Fun stamp set. After stamping the first tree (the front one) I cut out a mask and covered the tree and then stamped two more so they look like they are behind the first one. I love Cherry Cobbler and Lucky Limeade together. (I know I already told you that yesterday, but I really do). 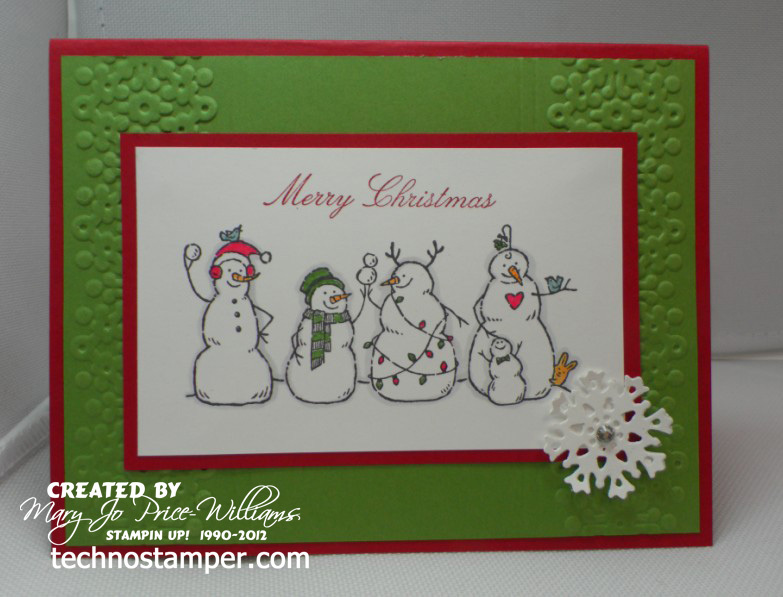 And of course my sample--which I have combined with this week's Latenightstamper's Challenge--use your favorite Christmas Color Combo--this is Cherry Cobbler and Lucky Limeade along with black and vanilla. 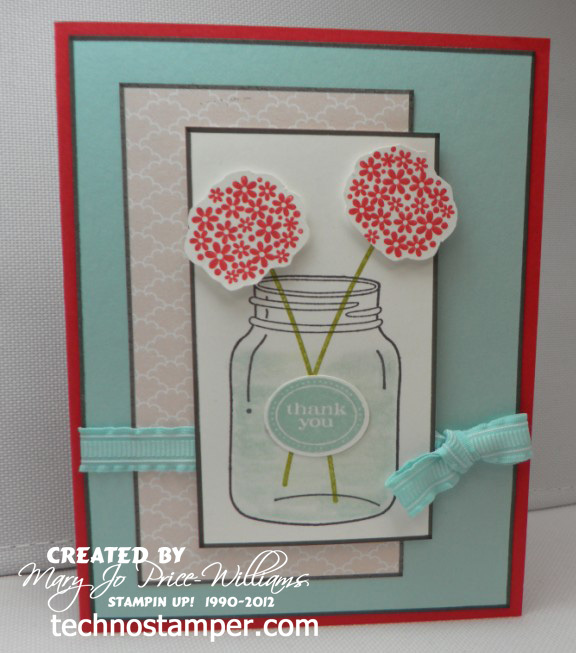 Tip: The leaves on my flower are just another flower stamped in green and cut to go on each side. Now it is your turn to play along--please remember to add a DIRECT link to your project and not just a general link to your blog. Thanks for visiting and playing along! 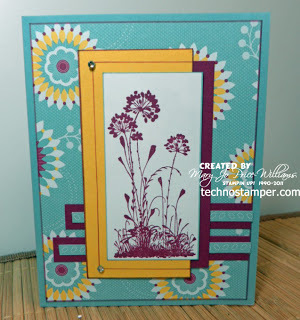 Yippee I am so happy to announce the top three for last week's sketch challenge. Some great ideas this week ladies. Don't forget to come on back and see the new sketch right after this post. Here are my top three picks in no particular order--I would love it if you would take a moment to visit them and leave a comment! 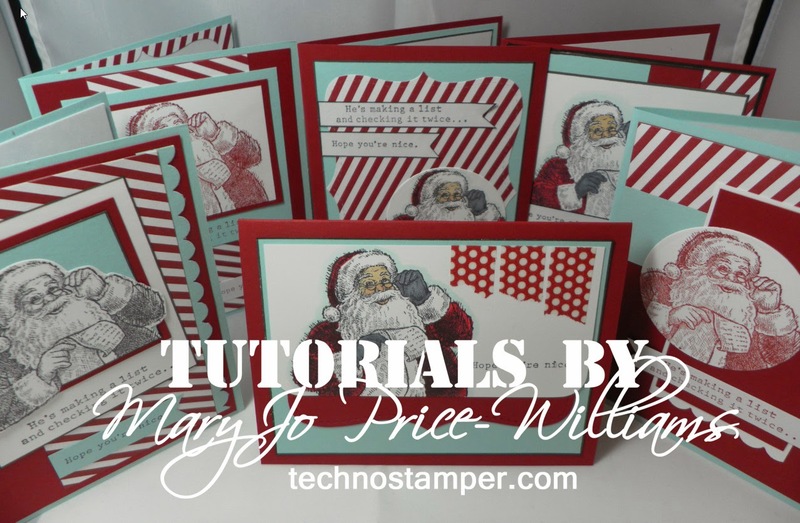 A few different things to post today--I needed a break from the Christmas cards so I played along with the SUDSOL sketch challenge and made a few giftables for the Latenightstamper's challenge. 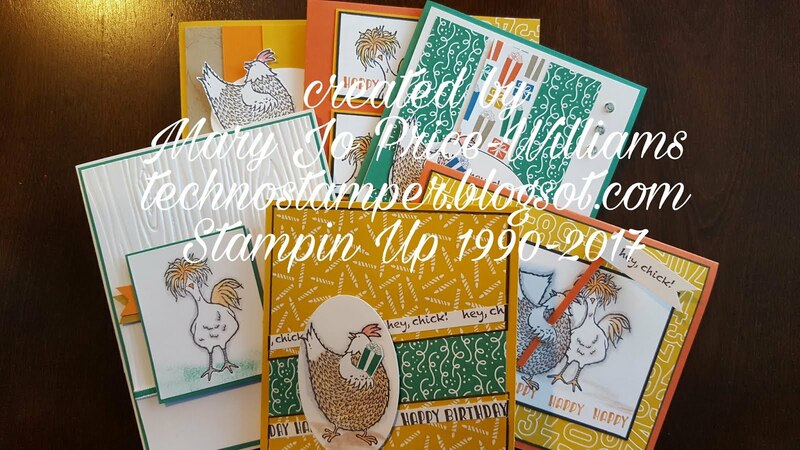 I finally broke down and purchased this Perfectly Preserved stamp set and I am so glad I did--it is so fun to play with. I love the Real Red with Pool Party, don't you. Next are a few simple giftables. Nothing too fancy just quick and cute. The first on is for someone who loves to do her nails. 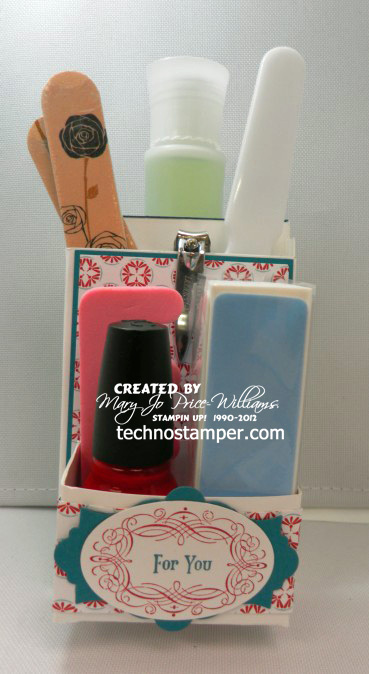 I created the little pocket/box to hang off a bottle of nail polish remover and hold some nail stuff. I was not happy about the fact that I could not find matching files, and such. Oh well it is the thought that counts right, lol! And finally a candle using a bunch of pre-cut papers that I no longer needed. They were left over from a class project so I rolled them up and attached them to the outside of a gladd votive holder. Finished it off with a strip of cardstock and some retired felt snowflakes. That is it for tonight--I will be back in the morning to post the new sketch for the week so be sure and stop back--Goodnight! 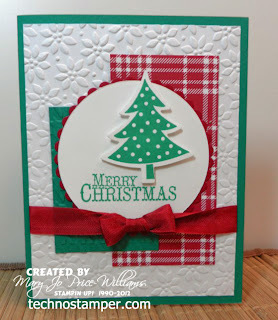 It is hard to believe that I have not posted at least two cards a day lately since I have so many made but it still takes time to get them on here. So I think I WILL share two with you right now. 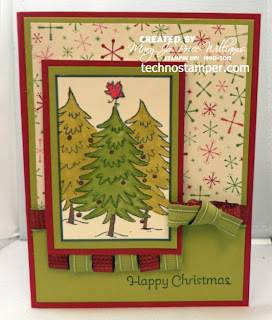 Both cards above use the tree from Scentsational Seasons and the matching dies. I just love this set! 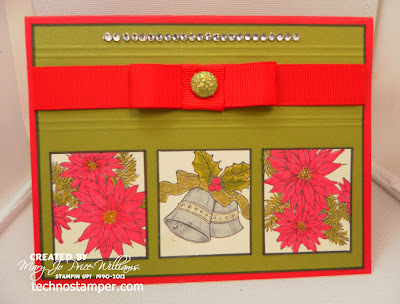 Other: word window punch, rhinestones, marker, apothecary accents dies, dies that match scentsational seasons. 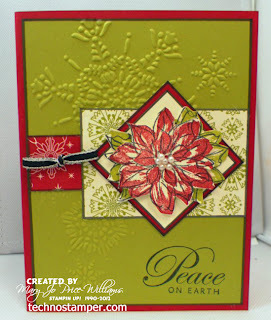 Other: ribbon, Petals a Plenty embossing folder, spellbinder dies and the dies that match scentsational seasons.